I wrote in January 2015 here about Google removing the user avatar icons from the top-left of Chrome which allowed fast switching between Google (Gmail) accounts (and having multiple accounts open at once). Included in my post was a way to switch back to the old icons. Unfortunately, I’ve just noticed that Google has changed it again and I can’t figure out a way to change it back. However, I have a tip to make it easier to switch between the accounts. Look for the new user tab at the top right of Chrome, right-click it, and then select the account you want to open. This should open a new instance of Chrome signed in with the other user. If you have come here looking for a way to be signed in to two or more Google accounts at once, please let me know and I will reply with a tutorial to set it up (if I get round to it). 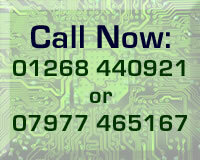 Alternatively, if you’re in a rush, contact me and we can set up a remote support session and I can do it for you.